Thomas Levy's team capturing high-definition digital photographs of the Royal Tombs at Petra, Jordan, using a helium balloon system. In January, it was confirmed that St. Elijah’s Monastery, the oldest Christian monastery in Iraq, was completely destroyed by ISIS troops after standing for 1,400 years near the city of Mosul. The race is on to digitally preserve thousands of other at-risk sites around the world before they meet a similar fate – but the work doesn’t end there for cyber-archaeologists. "People have been destroying material culture representations of their enemies for millennia,” said Thomas Levy, distinguished professor of anthropology at UC San Diego and director of the Center for Cyber-Archaeology and Sustainability at the Qualcomm Institute. Archaeological sites today face more serious threats than ever before. “When intolerant radical ideologies are coupled with modern bombs and bulldozers, the potential for total destruction of heritage sites is unparalleled compared with the past,” said Levy. If cyber-archaeology sounds like Indiana Jones with a laptop instead of a bullwhip, you’re on the right track. “Cyber-archaeology is the marriage of archaeology with engineering, computer and natural sciences,” Levy said. His research group focuses their efforts on the Middle East, currently the most critical area for threatened archaeological sites. Of the 48 World Heritage sites in danger listed by UNESCO, fully one-third are in the Middle East, a result of the high concentration of remarkable ancient sites in one of the world’s cradles of civilization. Religious extremism is just one of many threats facing cultural heritage sites around the world. “Cultural heritage sites suffer from looting, erosion, natural disasters and development. We’re certainly not immune to this, even here in California,” said Levy. Levy and his team were recently working at Petra, Jordan’s famous UNESCO World Heritage site dating from the third century B.C. Indiana Jones went to Petra on horseback in search of the Holy Grail; Levy’s team brought helium balloons and high-definition 3-D photography systems. Petra was mostly destroyed by an earthquake in A.D. 363. Today it’s under threat from excessive tourism, looting and graffiti. 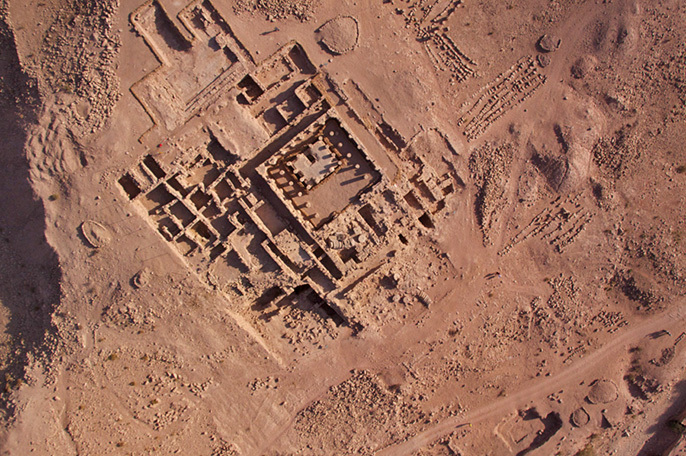 “The American Center of Oriental Research in Amman, Jordan, asked us to apply our helium balloon high-definition photography system to record Petra’s extensive ancient city center in 3-D,” explained Levy. “Our georeferenced 3-D model is now freely available to researchers who want to study all aspects of Petra's ancient architecture and topography." 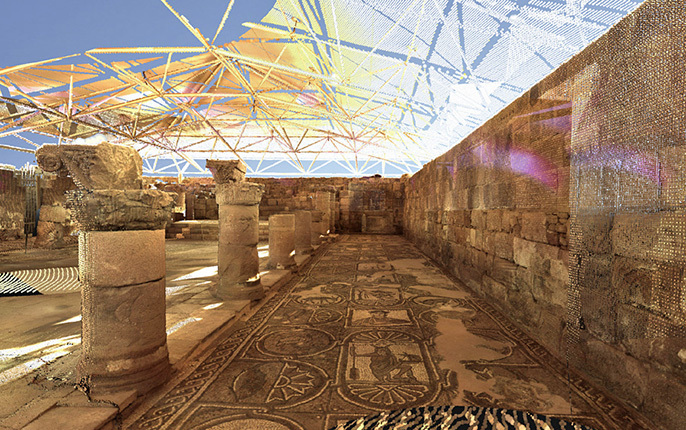 LiDAR point cloud depicting the mosaic floor on the south side of the Petra Church, visualized using Visicore, visualization software developed at Calit2/CISA3. Petra is just one piece in a much larger puzzle. Levy is gearing up to tackle the next big hurdle for cyber-archaeology: once you capture digital information, how do you store, share, collaborate on and display the data to researchers and the public? This is no trivial challenge. Today’s archaeologists are equipped with a suite of new and rapidly-evolving digital tools. The data files from these tools – including laser scans, high-definition photos and videos, aerial drone footage, and detailed climate measurements – are numerous and large, and, because of this, they’re generally hidden from view. Levy’s current project, a collaboration with researchers at UC Berkeley, UC Merced and UCLA, aims to deal directly with the issue of managing big cultural heritage data. This effort recently got a big boost from a Research Catalyst Award of just over $1 million from UC President Janet Napolitano. The joint project pulls together complex data from satellite imagery, 3-D data capture, drones and other techniques from locations in Egypt, Turkey, Jordan, Israel, Greece and Cyprus covering over 10,000 years of cultural materials, architecture and landscapes. Because of the vast scope of the data, the researchers will leverage the recently announced Pacific Research Platform (PRP), a high-capacity data “freeway system” that, when complete, will bring together most of the research universities on the U.S. West Coast and Hawaii, National Laboratories and national supercomputer centers, and a few more distant institutions, including the University of Amsterdam. The PRP project is led by Larry Smarr, director of the California Institute for Telecommunications and Information Technology (Calit2), a joint UC San Diego and UC Irvine initiative. “The significance of Levy’s Catalyst project for the PRP is that digitized cultural heritage is becoming a major big data application. Distributed collections need to be interactively available to scholars wherever they are located," said Smarr. Levy envisions that the new platform will enable studies of the correlation of regional climate and demographic data with cultural and technological change on a scale that hasn’t been possible before. The data platform will enable much more detailed studies of how human conflicts, climate change, pollution, natural disasters, and looting affect archaeological sites and help forecast future areas of preservation concern. High-definition balloon photo of Petra's Temple of the Winged Lions. Aerial images like these can be used to monitor site conservation and facilitate research around the world. With sites that are threatened but still intact, like Petra, cyber-archaeology can contribute to ongoing conservation and research goals, and virtually reconstruct ruins to give visitors a glimpse of how they might have looked in the past. When a site is totally destroyed, digital data can play a different role. After the Taliban destroyed the sixth century Bamiyan Buddhas in 2001, digital information collected by researchers helped study to continue, and in 2015 made it possible for the Buddhas to be temporarily resurrected as a 3-D laser light projection. The digital data could also facilitate future restoration work. Levy is bullish on the potential of 3-D visualizations both for research and public display. Taking advantage of the Pacific Research Platform and the cutting-edge virtual reality technology being developed at UC San Diego, Levy’s group will install walk-in 3-D kiosks at the UC libraries for viewing digital objects and sharing heritage data in real time –­ a virtual reality experience almost like a simplified holodeck from Star Trek. "The PRP is jointly operated by Calit2 and UC Berkeley's CITRIS, ensuring that both southern and northern California campuses are well served," DeFanti added. Using 3-D video cameras and 3-D computer models, patrons of the kiosks will be able to travel to cultural heritage sites and explore them as if they were there. The 3-D kiosks are planned for UC San Diego’s Geisel Library, UC Merced’s Kolligian Library, the Phoebe Hearst Museum at UC Berkeley, and the Fowler Museum at UCLA. True to the spirit of the Catalyst Award, Levy’s aim is to catalyze further cyber-archaeology work and help bring field archaeologists toward a unified digital platform.